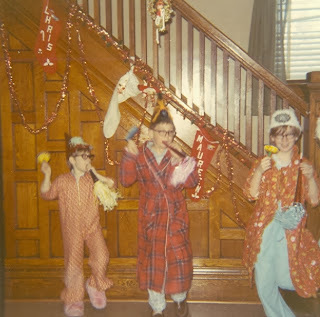 Christmas Eve was a magical time during my childhood in the 1960’s. This was a time before Christmas became such a commercial, secular holiday with the seasonal focus on rampant commercialism; when children received gifts only for Christmas and birthdays; when people bought something when they needed it and purchased new clothes for a special occasion or the start of the school year or at the semi annual shoe sale. 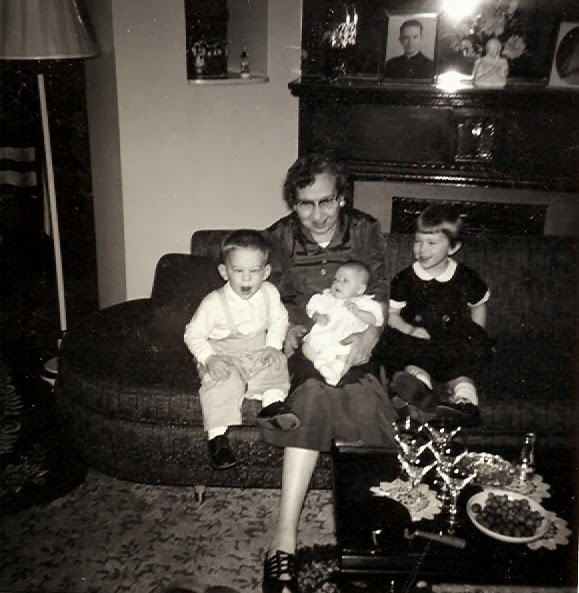 Every year as long as I can remember our family traipsed down the block from our house to that of my grandparents, who lived on the corner across the street from the rectory of St. Bridget’s Church in Logansport, Indiana to enjoy Christmas Eve dinner. Sometimes dinner was served on my grandmother’s pre-war Noritake china, which I used for Thanksgiving this year. The meals I remember most vividly are those of the spaghetti served on my aunt’s pink /black square bake-lite dishes, pull apart rolls, and servings of cranberry relish. Our local relatives surrounded the drop-leaf table. In the earliest years, seated around the table would be my grandparents, my mother’s sister, Aunt Kate (who always had Hershey bars and Archway cookies and long yellow fingernails from nicotine), Uncle Mart, Aunt Lerna, and Marguerite and Al from across the alley who had a beautiful white dog that barked a lot and a Victorian gazing ball in their back yard. After dinner my parents piled us into the car and we drove around the town looking at the outdoor Christmas decorations. We always looked forward to seeing one house in the county that put on a show worthy of Clark Griswold, long before extravagant or excess became the norm. 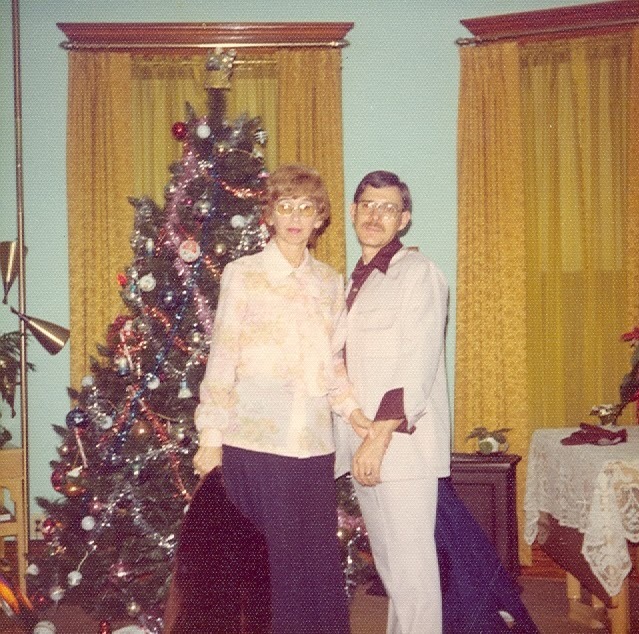 Then we returned to my grandparent’s house to find Santa had been to visit, depositing an abundance of treasures, such as my first Barbie (the Barbie with the 3 wigs) and Chatty Kathy (who spent a great deal of time at the doll hospital). We always wondered with awe how Santa knew we would be visiting grandma & grandpa? My aunt filmed all of the glamour in state of the art 8mm! And we thought it was an amazing treat to watch the previous year’s movies with the sound of the projector churning to the jerky movements on the screen. These are still the warm & joyous memories of childhood. We felt so truly blessed to have two Christmas celebrations. 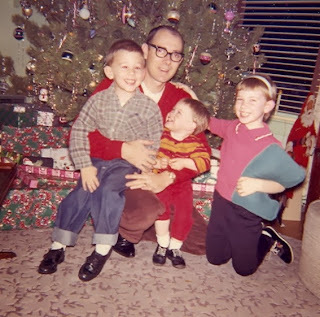 For after we left our Christmas Eve extravaganza, we headed home, were tucked into bed, and waited with excitement and anticipation for that second visit from Santa Claus on Christmas morning. As Bob Hope used to sing at the conclusion of every TV special ~Thanks for the Memories.